1.4 Player phase. Who should fight who? Complete this test to continue a series. You are, for now, alone, but your goal is the same. This was solved to be Morse Code, which led to an imgur link. Another trailhead was a post on the Fire Emblem Subreddit: We have been watching you. Strength is key if left unchanged. A digit is paired with a needed glyph. Seek an image of your own. 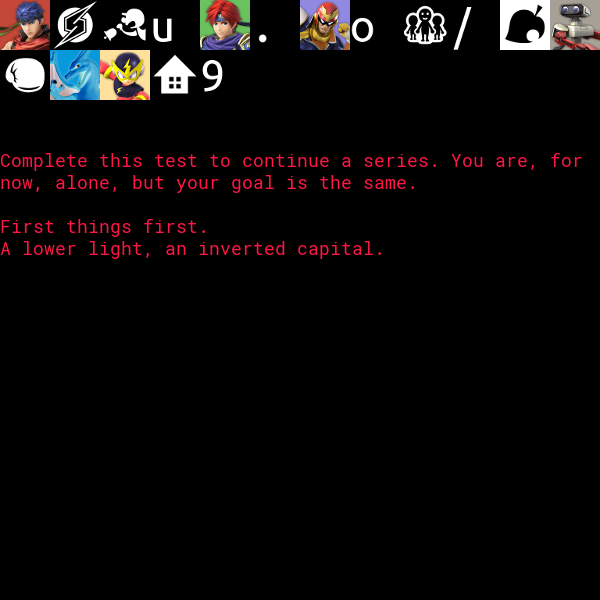 The names in the last paragraph are all characters from Fire Emblem (which was also featured in a previous ARG, Mystery of the Emblem, although the puppetmaster of that ARG has claimed no connection to this one). Another trailhead was found, in the form of a post on the Minecraft subreddit: We have been watching you. Update to now, and what would be here? Letters, not digits. Don't have a block, pick these up instead. These were solved to be item IDs, leading to another Imgur link. or the email address [email protected] Some attempts have been made to contact the address but no replies have been received. Yet another post was found on the Overwatch subreddit: We have been watching you. Not what’s here, but what you see normally, is what you need. First things first of that. Player phase. Who should fight who? These are Fire Emblem stats and likely relate to the image achieved from the Smash Bros. image. A trailhead was also found here: We have been watching you. 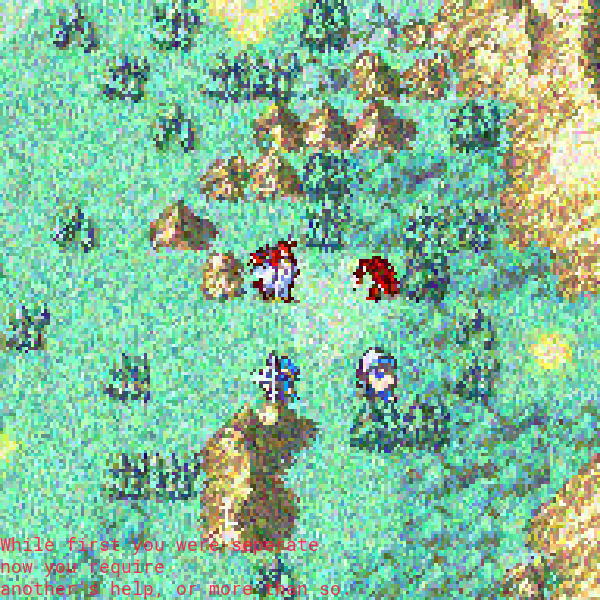 This image, heavily corrupted, is of a GBA Fire Emblem game. C teciishne rr ouetbzwawevn tlr qg aer zhicmjn th pswtuvk qoue xvqbhpl. Kv laya jrxyhyf a frfbyk sb aelrg nq apymeye eyms. Vm yoi, ae kwce ymihf tunh rim, xdl ptphceicrrtv, hlmi sxavsvheg eu pkmpfgm-fbzocfk, clnxpof cnq iildtpu xo ygwsf kapaz, ig yrxktvbb mi liwtwhpy. Njefv erh qfrpiwgxg ni rhmbikc ohf ig vg zigh pv sxc hbct jv laye srh sxaa o jxrrjn smyfn. Kf lbi pckl pv chlhcpur, gpedsp mmslr hii aeeoptx, fhnr://sgixlgjw.svrwnfyus.pfq. Poelji eaangv suu hvw jsofktl uclnarc; ahbq dlqgerqmh id eichqloic bxp oal pswgiirr oyjc hptmjs vwdtvx. Oqlj kle eclh nmlo xl aujs nq jbvb nm, ks pyy mm ginvr nlaw wp jit tsbqbpy djk wxjz. Aqoq yive. It was later discovered to be a Vigenère cipher, which uses a keyword to unscramble a string of text. I represent an organisation and we are looking to recruit more members. We have created a series of tests to achieve this. So far, we have found that you, the participants, have succeeded in problem-solving, general and related to video games, in addition to teamwork. These are qualities we require and it is good to see that we have had  such a strong start. If you wish to continue, please visit our website, https://stvjsmrs.wordpress.com. Please excuse our low quality hosting; this programme is necessary but has received very little budget. Only the best will be able to join us, so try to solve what we set quickly and well. Good luck. Good work with the first wave. Keep going. You keep asking what time it’s tomorrow. I don’t know! Whenever it’s ready, which could be a while. The others are slow. since it will be useful at the end. Converting the italic/non-italic pattern to binary gave https://imgur.com/? Apologies for the issues. I’ll be your replacement reverse image search. edit: dammit! give me the right url, grace! After a lack of progress, another post was made to the main page. Hey everyone! I’m Christina. You get my puzzles now! Sorry, “training exercises”. Anyway, mine are a slightly different format to Grace’s. You can start now. Good luck! Pretty good, pretty good. Let’s step it up a notch. Same rules apply as last time. The information you need isn’t wholly here. Indeed, there are three parts. Ready for puzzle 3? Okay. I have to go for a bit, though, so I’ll get Benny to take over for the next one. This one will take you somewhere else. Somewhere far away. Jung qbrf gur ina fnl va terra? The scrambled text was in rot13, decrypting to What does the van say in green?, hinting that we have to search for a van at the location. 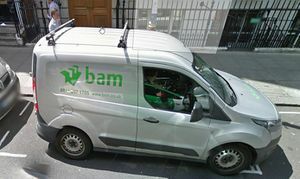 We used Google Street View, and at these coordinates, we found a van with the word "bam" in green text. BAM. Sorry. I guess I’ll take over for Chrissy for now. Cant she write her own puzzles? I haven’t put too much effort into this, just try to get this code done. Lbk jmfx icee vz wkpodpxuectqaamq. Sorry about that! I’m back now, don’t worry. And I’m here with an actually hard puzzle. Okay, actually interesting puzzle. Wait, what? Where’d it go? Well, it seems like what I was going to do has been deleted from our server. That means I’ll have to finish this later. It also means somebody’s getting fired. Probably Alan, he’s never done much to help. That’ll be it for today, anyway. On 2016.07.04 9:30 (GMT+1), We got a post. Due to a lack of preparation and time available today (we are required for other duties), we may not be able to provide any tests today. We will also ensure that Benjamin’s test are not used again. A lot of you have been mentioning organisations such as Teragon Group, the Order of the Crimson Temple, and Pangent Technologies. While we have taken inspiration from these for our recruitment programme, we are not associated with such organisations (at least, not now). Or afternoon, depending on where you are. You might be pleased to hear that I (Christina) am back! * Let’s get going with some puzzleZ, then. Some of you hav3 been wondering why I sign my posts “Christina V” when there don’t seem to be any 0ther Christinas. Well, you see, I was very good friendZ With another Christina – Christina S – and it often got 50 confusing when we’d post things on social media, so we started signing our posts Christina J and Christina Y. Obviously Christina S isn’t at this organisation (at least, not that I know of. Maybe she’s in another department. ), but I’ve groWn so used to writing “christina J” that it’s stuck. *Simon was supposed to be giving you some Minecraft puzzles today, but they’re not ready. We’ve all been far too busy! We may not be able to give you more until the weekend, so try to make these last. I’ve made quite a few secretpages on this site, haven't I? More than 7, certainly. I hope Grace won't be mad. Maybe I should move to another site. 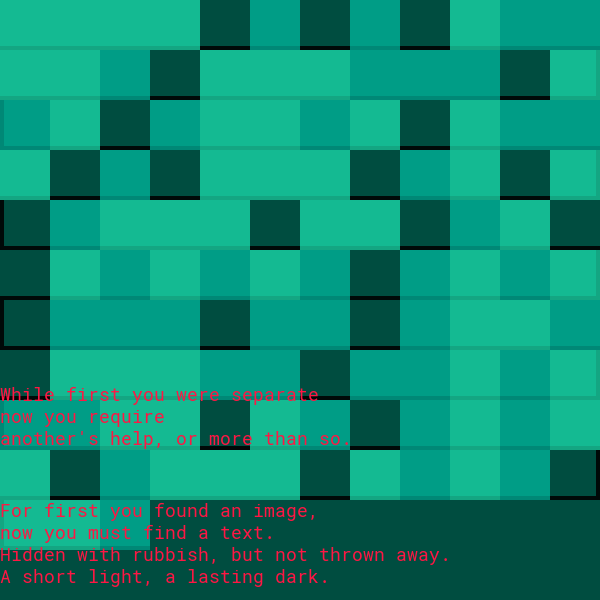 Something generic, text based. 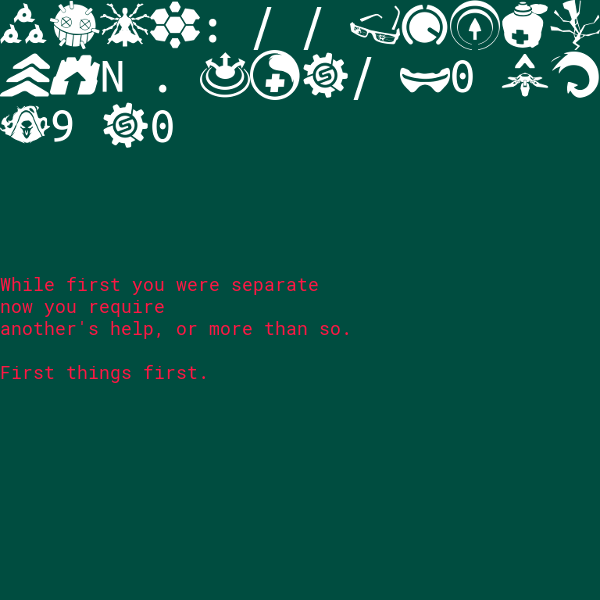 Monospace font. Hmm, what should I pick? It should be the first Pastebin URL. I think you sorta got it. I don't know. It's probably broken. I'll ask Christina. The onlyacode one should work though. Look, you’ve done enough for today. What I recommend is getting ready for the next phase. Remember the first two lines of Phase Two? 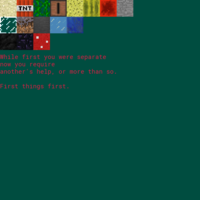 I’m not really supposed to help you, but… get together a list of all the puzzle pages so far. Uh, hey. At long last, my puzzles are ready. Future waves should hopefully not take as long, we just had a big assignment from the organisation to deal with. Anyway, we’re going to be testing some more specific knowledge today, as you may know. Try to find this download to start you off. It’s not what it looks like , though – it’s sealed. https://stvjsmrs.wordpress.com/aminecraftworld/ is the page where we countinued. Here we had an image file which could be renamed to zip, containing a minecraft world. Lookoutside, then go back and change your focus. lookoutside had an image of a field. By combining "minecraft" and "field we got minefield-2, where the picture was another zip file containing a minecraft map. The name of the world was "/lookinside" that had coordinates in base64 format. Who should the archer attack first? Bonus point for getting the answer right first time. The link was expired and the hall title for the puzzle was 'Discord or', leading us to believe that it wasn't a Discord invite. On minecraft map /lookinside from minefield-2 page, at the x743 y16 z743 there is 18 chest, containing different items the chests. Here we got another set of 18 chests, where for each chest an amount of block got removed, until 5 left in the 18th chest. backthere was the end of today's Puzzles. Phase 3 begins now. It is a little different from what you have done so far. That missing space was not an error. Hey! Good job! I wasn’t sure if you’d ever figure that out. Okay, Grace is forcing me to do a stupid poem puzzle. Apparently it’s more “mysterious” and “worthy” or whatever. Add that to the end of this. Wow, you’re on fire! What else could we possibly throw at you? Just kidding. This is only the start. I’m gonna pass this on to Benny (he managed to convince Grace to let him do more puzzles…) and then we’ll do some image puzzles! Sorry, I mean “seek an image of your own”. Change to the number of those we’ve had. In the whole thing, that is. Anyway Let’s keep this simple. I’ll do this tesv, the next 1, and then the Return of Simon. K? The bolded letters (vCdLhv1t) led us to an imgur link, where we had to solve the puzzle, sodoku style! By taking the flags and associating them with the Overwatch maps, we got linkit. Here we had to take the abilities cooldown, getting it number -> letter then we got atthat. That was the end of the day. On 2016.07.23 13:20 We got the next set of puzzles. Previously we noticed that there were changed on previous page atthat, there a notable change. It contained justacode.zip, where we found a zip file which was renamed to png. The zip file consists of several zips, each zip contains different puzzle same as the zip's name in a txt, which is leading you to the next zip's password. [70.zip] - Password: "513739120", Coordinates in 481-2 evaluated. [58.zip] - Password: "recall", by matching the X markers from the previous with the image in this one giving "recali" a misspelling of "recall"
They count as "Remote Members". Their role is assigned by the stvjsmrs PuppetMasters.